Equus. There is new excitement in Australia's burgeoning world music patch! The buzz is all about the new band EQUUS. 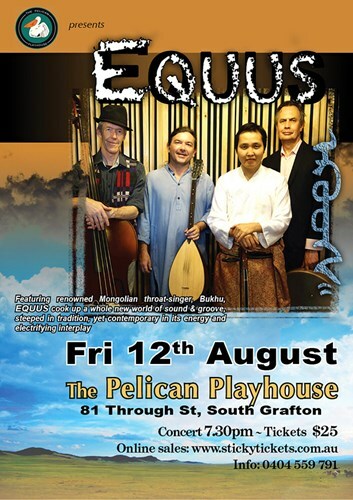 A gathering of 4 musicians of very diverse musical and cultural backgrounds, Equus' debut album Dakshin Khun (Southern Man) focuses on the traditional music of Mongolia, sung by world renowned Mongolian throat singer Bukhu, fused with Middle Eastern strings and wind and a dynamic rhythm section, with a strong component of improvisation to making each performance a new experience, the result is often hard to define, but always spectacular and unique. Joined by well known Blue Mountains musicians John Robinson (Oud, Turkish Baglama) and Peter Kennard (Percussion), as well as Double bass extraordinaire Bertie McMahon. This music is about meetings, of people and traditions, and of musics. EQUUS is a bold, imaginative music project that succeeds in the formation of an entirely new sound.